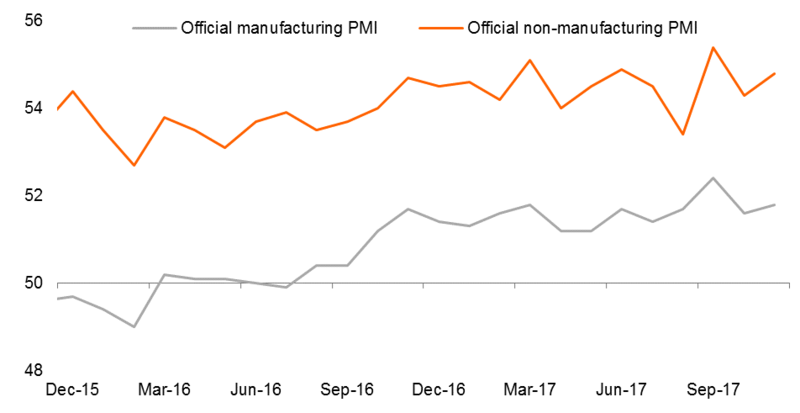 The good manufacturing and non-manufacturing PMIs in China were driven by seasonal factors that may not last for another month. The 11-11 online spending spree could be behind the upbeat manufacturing and non-manufacturing PMIs. We believe that 11-11 festive spending brought increased activity in packaging, logistics, and of course manufacturing of goods. However, this is seasonal and unlikely to bring another surprise next month. 11-11 also helps medium-sized factories because ad hoc urgent orders caused by overwhelming online shopping orders are usually manufactured by medium-sized factories. This helps to explain why the medium-sized factory PMI rose above 50, to 50.5. The PMI numbers mean economic growth in 4Q should be more to the upside, and support our GDP forecast of 6.8% for the whole of 2017.